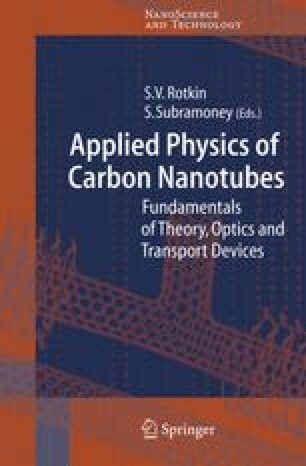 An overview is presented of basic and applied aspects of the fluorescent photoluminescence from single-walled carbon nanotubes (SWNT). This fluorescence was first discovered in aqueous surfactant suspensions of SWNT that had been processed for enrichment in individual, unbundled nanotubes. Spectrofluorimetric measurements of emission intensity as a function of excitation and emission wavelengths revealed a rich pattern of peaks representing distinct (n,m) structural species. Careful analysis allowed each of these peaks to be assigned to a specific semiconducting (n,m) species. This spectral assignment provided a large body of precise optical transition energies for a significant range of tube diameters and chiralities. Important patterns of electronic structure emerged showing the related properties of nanotubes within “families” (sharing the same n-m value) and “tribes” (sharing the same mod(n-m,3) value). The results also allowed construction of an empirical “Kataura plot,” useful for guiding experiments, that gives optical transition energies as a function of nanotube diameter for semiconducting species. In surfactantsuspended samples, optical transition energies are found to depend mildly on nanotube environment. Spectral line shapes reveal the predominant excitonic character of optical excitations in SWNT and provide information on environmental heterogeneity and on exciton dephasing rates. Nanotube fluorescence is quenched by aggregation, chemical derivatization, and by acidification in some aqueous suspensions. Fluorimetry offers a powerful method for determining the (n,m) composition of mixed nanotube samples. Instrumental methods for such fluorimetric analysis are discussed and compared. Finally, the unusual near-infrared emission from SWNT can be exploited to allow selective optical detection and imaging of nanotubes in complex environments. Early results are presented showing how this approach can be used to image the locations of nanotubes inside biological cells.